announce the Honda College Graduate Program, a means of seamlessly moving from that couch into the real world! With the Honda College Graduate Program, recent and upcoming graduates can now receive discounted pricing and additional incentives on a new Honda vehicle! Just imagine all the eventual perks! You can start your first day at your new career driving a fancy new vehicle, and you can even build credit while you do it! Additionally, the program is remarkably flexible; you might be eligible for an option to defer payment for the first 90 days, and with the competitive financing and lease packages, you might find yourself paying less than you’d ever imagined. Visit Honda of Toms River today for further details about the College Graduate Program! 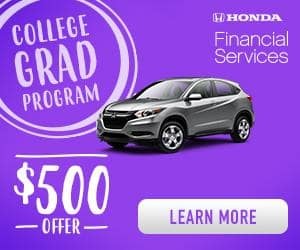 The process to receive the $500 discount with the Honda College Graduate Program is remarkably simple. To be considered for the program all you have to do is A) Provide a 5% down payment, B) Have proof of current employment or of a firm commitment from a future one, C) Be graduating in the next six months or have graduated in the last two years, and D) Provide Honda of Toms River with your credit and document requirements showing no negative credit history. It’s that easy! Once you’ve completed the above steps, you’ll be eligible to choose from any new Honda vehicle from the current model model year or newer! Can you imagine cruising through the next phase in your adulthood with the popular Honda CR-V or the sporty and efficient Honda Fit? Well, imagine no more! Enroll in the College Grad Program at Honda of Toms River today! The next step in your life is filled with plenty of uncertainty, but securing your mode of reliable transportation–and saving money and establishing credit in the process–doesn’t have to be one of them. With the Honda College Grad Program, you can now set yourself on a course that will be more defined by smooth sailing–or driving, if you prefer–than by troubles and stress.The Honda College Grad Program is now available at Honda of Toms River. To learn more about the many ways that this offer can get you off and running into adulthood, we encourage you to visit our dealership today. We will also provide you with all the necessary vehicle research and financing information to ensure that this process will be a pain-free as possible. Visit Honda of Toms River today!